Rev. Edwin Drury (1845 – 1913). Son of Hilary Drury and Teresa (Coomes) Drury. Nephew of Leonard Knott. Brother of Dr. Ignatius Guy Drury. Born in St. Lawrence parish, Knottsville. Ordained into the Priesthood in 1872. Headquartered in Knottsville from 1899 – 1905. Uncle of Daviess county priests – Rev. 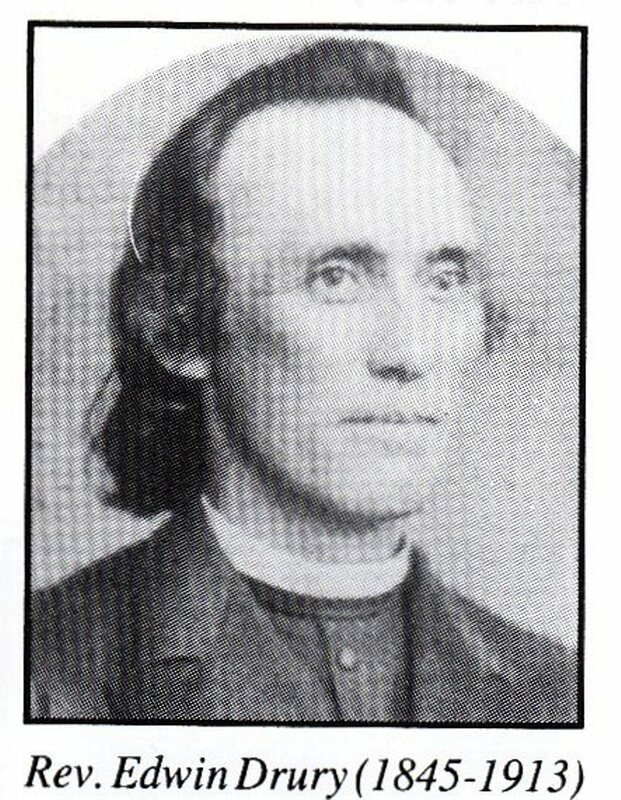 Louis Hilary Spalding and Rev. Celestine Brey. 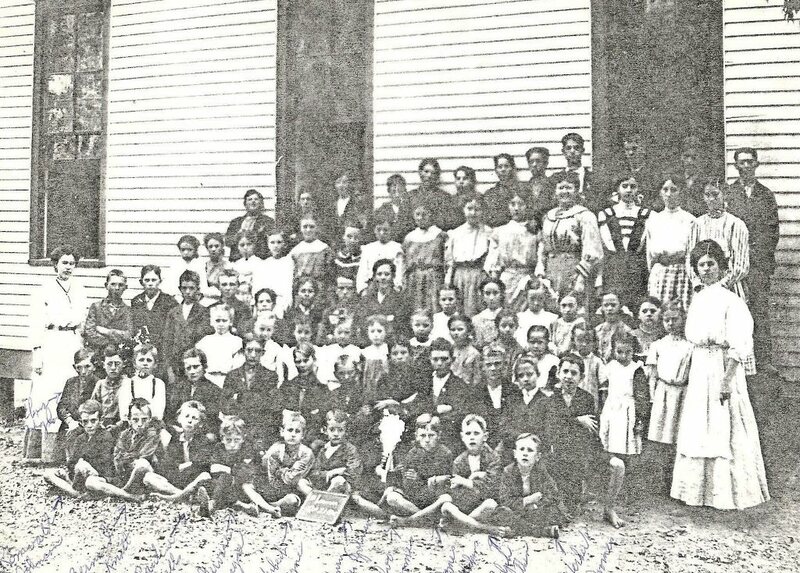 St. Lawrence School, Oct 21st, 1908. 1st Row/L to R – Romuald Johnson, Bernard Knott, Pauline Mills, Gervaise Payne, Herbert Payne, Henry G. Johnson, Ivo Coomes, James Hoskins (aka Father Mark), Ralph Wathen and Herbert Coomes. 2nd Row/L to R – Wilber Higdon, John Wathen, Lamar Montgomery, Forest Wathen, Damian Johnson, Felix Coomes, Ira Craig, David Henning, Dolor Cecil, John Cecil, Bernard Henning and Celestine Henning. 3rd Row/L to R – Cecilia Coomes, Mary William Knott, Nellie Speaks, Katie-Bee Higdon, Mary Agnes Henning, Edna Long, Velma Payne, Pauline Henning, Ella Knott, Helena Knott and Bernadette Speaks. 4th Row/L to R – Fannie Head (aka Sister Ignatia), Henry Mills, Felix Roby, Eddie Henning, Roy Knott, Henry Montgomery, Oscar Coomes, Paul Knott, Sylvester Coomes, Mary Mills, Cecy Johnson, Waltrude Higdon, Beulah Coomes, Fannie Lou Poole, Blanche Payne, Cecilia Miles and Sue Cravens (aka Sister Joseph). 5th Row/L to R – Ethel Montgomery, Goldie Poole, Rosalia Miles, Eunice Cissell, Lizzie Wathen, Gertrude Roby, Katie Hensey, Mary Louis Wathen (aka Sister Lucian), Agnes McDaniel, Della Henning, Gertrude Miles, Katie Cissell, Pauline Montgomery, Fred Henning, James Wathen, Harry O’Bryan, John Blincoe, Robert Henning, Joe Frank Coomes, Louis Miles, John Coomes, Titus Johnson, Joe Miles, Eugene Montgomery, Emmet Kennedy and Guy Blincoe. (Photo copy and list of names provided by Larry Abel). 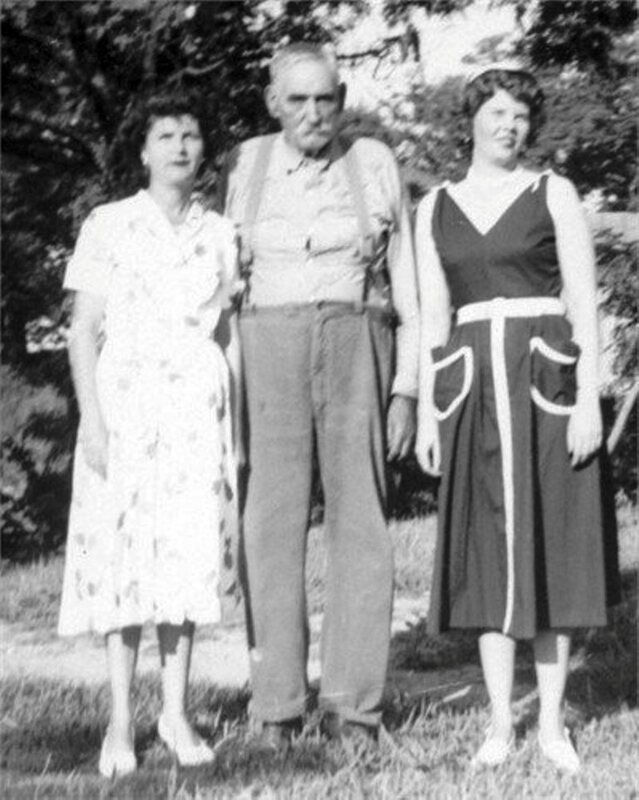 Left to Right – Theresa Geraldine Mattingly Hartlage (1916-1996), Charles Carroll “CC” Mattingly (1866-1958) and Mary Kathleen Mattingly Short Goode (1922-1965). Charlie was the son of Clement B. Mattingly and his wife Ann Mariah Payne. Married four times: In 1891 to Nannie M. Marsch (1871-1904); in 1905 to Mary Jane Coomes (1872-1918), widow of Joseph Walter Head; in 1919 to Elizabeth Victoria Quinn (1865-1924); and in 1924 to Regina Bell Bowlds (1881-1972), widow of John I. Payne and also James J. Cecil. Photo circa 1953. 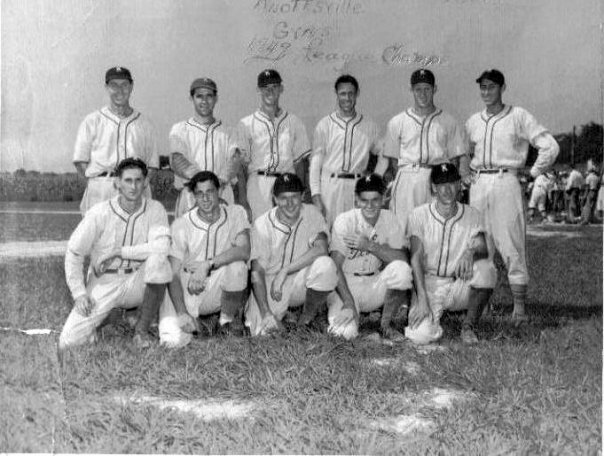 Knottsville Ball Team, 1948 Pennant Winner; 1949 League Champions. Back row. L-R. Gus Higdon (Manager), Claritin Higdon, Les Keown, Paul Millay, Ray Keown, Billy Higdon. Front Row L-R. ?, ? ,Tom Keown, Billy Estes, ? Duncan. Photo courtesy of Mary Helen Rhodes. 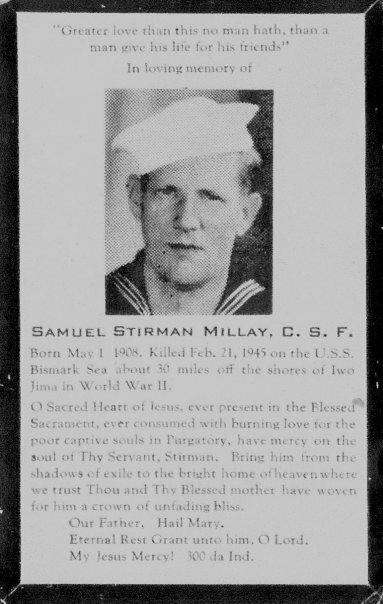 First Daviess county military death during the Vietnam War. Charles Francis “Frankie” Millay (1941 – 1965). Son of Joseph Marshall Millay and Jane Martine Payne. Frankie was the first Daviess county military death during the Vietnam War. He’s buried at St William’s cemetery. This Messenger-Inquirer newspaper clipping is from 1965. Dennis Millay sent me the link to this interview that was on NPR. Click on the “Listen” link at the top of the article. You will hear some familiar voices from people in the St. Williams/St. Lawrence area on making burgoo for our picnics. Thanks Dennis! Check out the Facebook page that Dennis is running to gather and compile history about Knottsville. The link is on the right side of the page.